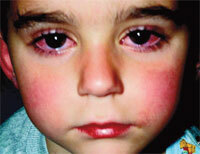 A SIMPLE urine test is now enough to spot Kawasaki disease. It is a poorly understood illness that hits children and affects their mucus membranes, lymph nodes, walls of blood vessels and heart. Diagnosis is difficult as most of the symptoms of the disease—fever, rashes and enlarged lymph nodes—are similar to most viral and bacterial infections in children. However, the new test developed by researchers from Boston Children’s Hospital of Harvard Medical School in the US, is reliable. For developing the test, the researchers studied the proteins in the urine of 107 children suspected of having Kawasaki disease. They found 190 proteins were unique to the 53 children ultimately diagnosed with the disease. They say that children with Kawasaki disease can be spotted with 98 per cent accuracy by detecting the presence of two proteins—filamin C and meprin A in the urine. These proteins are released in the body if there is an injury to blood vessels or cardiac muscle cells and in case of inflammation even in healthy people. If not detected early, the disease can cause inflammation of the blood vessels and lead to an abnormal ballooning of the coronary artery, a condition known as aneurysm. The researchers says these proteins may prove to be the first biomarkers (indicators that can tell the biological state of a person) for the Kawasaki disease. The results of the study, published in EMBO Molecular Medicine on December 20, 2012, might be particularly useful for Asian countries where the disease is more prevalent. In Japan one out of 100 children is at a risk of contracting the disease. Elucidating on the validity of this study in India, Saji Philip, secretary general of the Kawasaki Disease Foundation India in Parumala, Kerala, says there have been prior studies on biomarkers for the disease but they used blood serum not urine. “This test will act as supportive and confirmatory evidence since we do not know the etiology of this disease till today,” he says. In India, there are an estimated 250,000 new Kawasaki cases every year. An analysis of data on the disease between 1994 and 2008 revealed that Kawasaki incidence has increased from 0.51 cases per 100,000 children below 15 years of age to 4.54 cases per 100,000.